Well first there are two settings that matter. First is your VMFS-6 datastore configured for automatic UNMAP? The options for this are only none or low today. Yes the CLI reports medium and high, but the are disabled in the code, setting it to those will do nothing differently then “low”. The next thing is, is your host(s) enabled to participate in automatic UNMAP? The way automatic UNMAP works is that all ESXi 6.5 hosts that see the VMFS-6 datastore participate in the UNMAP process. They have crawlers that will run UNMAP to the various datastores intermittently. They will issue it to the dead space and dead space only. Once one host has issued UNMAP to certain regions on a datastore, no other host will then redundantly issue UNMAP to those locations unless it is written to again and then made dead again (by deleting or moving the data). By default, all hosts are enabled to participate. But a host can be disabled from participating in automatic UNMAP. This setting is rather hidden, so frankly, do not disable this unless through the direction of VMware support. If this is set to 1, that host is set to participate in automatic UNMAP. So how do you see if it has run UNMAP? Well the traditional method has always been esxtop. 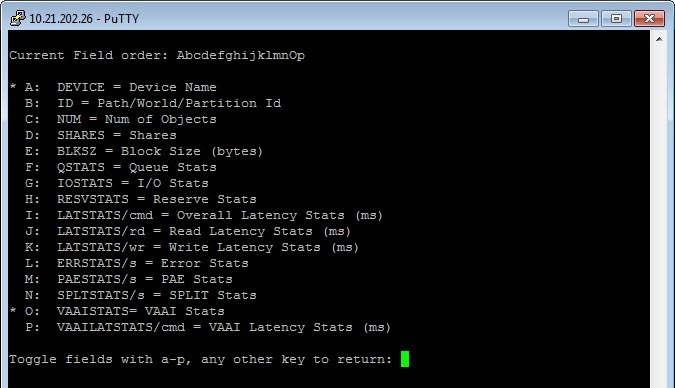 SSH into the ESXi host, type “esxtop” then enter and then type “u” then “f” then select VAAI statistics with “o”. DELETE is a counter for UNMAP commands issued to that device, from that host since the last reboot. DELETE_F is a counter for failed UNMAP commands issued to that device, from that host since the last reboot. Note that this isn’t like how many times someone ran the UNMAP command. It is literally a count of UNMAP I/Os. A single UNMAP operation could include thousands of UNMAP commands. The last column is not a counter, but instead a indicator of the throughput of any UNMAP operations going on right now from that host to that device. So if no UNMAP operations are running right now, it will be zero. So we have known about this for years, what changes with async automatic UNMAP? Well this reports on ALL UNMAPs to that device, whether manual or automatic. There is another counter that lists just automatic UNMAP commands issued. It is with a tool in ESXi called vsish. ***Before moving on, do not make environmental changes with vsish unless directed by VMware support as noted by William Lam here. Querying information like below is fine though. SSH into your ESXi host and type “vsish” and then enter. If you CD into /vmkModules/vmfs3/auto_unmap/volumes/ you can then type “ls” to see the volumes. This will show you all of the VMFS-6 datastores which that specific host has at least one powered-on VM on. If that host does not have any powered-on VMs on that datastore, that datastore will not be listed here. In other words, this list here is the selection of datastores which that ESXi host is currently monitoring to run asynchronous automatic UNMAP. So enter in your datastore name and run it. There is one important metric to note here. “Unmap I/Os”. This tells you how many UNMAP I/Os this host has sent to this datastore since that host was last rebooted. So how are these two different. Let’s run a test. First I have a new datastore and both vsish and esxtop report zero UNMAPs. After a few minutes both esxtop and vsish report the same values (68 UNMAPS). So what if I run a manual UNMAP? Well esxtop shows a ton more UNMAPs. This makes sense as it blindly issues UNMAP to the entire free capacity of the datastore, not just small segments like automatic UNMAP does. So for a true count of automatic UNMAPs being issued to a datastore from a given host, vsish is the way to go. Vsish counters are reset if the datastore goes unmonitored. So if you had a running VM on a datastore it would be monitored and UNMAPPED by that host. But if you power that off or move it to another host and it was the last VM on that host for that datastore, that datastore becomes unmonitored by that host and the counters reset to 0. So I think the point is, really for the source of truth, look at your array to see if space is being reclaimed. Resort to these counters on your various hosts only if needed. In general, just check these counters to see if they are indeed issuing UNMAP, if they are all zero something is up. 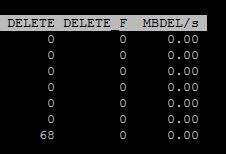 We met an issue with VMFS6 auto unmap months ago. 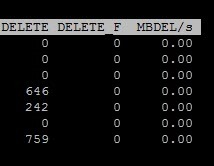 After delete some VMs or VMDK from VMFS6 datastore (VM is powered on), run manual unmap command immediately (esxcli storage vmfs unmap -l), but there’s no space reclaimed on storage side, we found no unmap command sent from ESXi. Do you know whether manual unmap supported on VMFS6 datastore, which is configred with auto unmap by default? I had heard there might be an issue around this, let me do some testing and get back to you. It should be supported though. 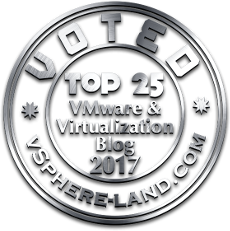 The esxcli UNMAP VMware KB article refers to is as being non-relevant for VMFS-6 but I believe that might be wrong, or at least misleading. Stay tuned.